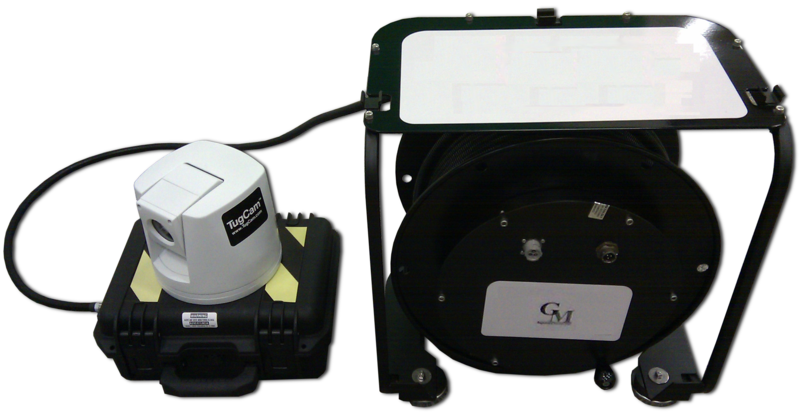 The TugCam from Netarus is designed to significantly improve navigation for a captain or pilot. By placing the eyes and ears of the captain anywhere on the vessel, safety is increased by eliminating the “information delay” associated with a conventional lookout. 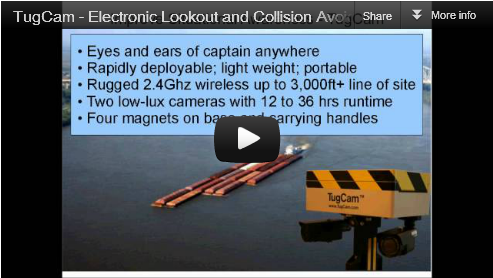 The TugCam (http://www.tugcam) is a rapidly deployable electronic lookout and collision avoidance platform. Purpose built for the harshest environments, the TugCam contains a wireless audio/video transmitter, rechargeable power source and waterproof ultra low-light camera(s). Optional add-on features include sensors, alarms, additional cameras and more. Rapidly Deployable TugCam. Improve Navigation. Reduce Insurance Premiums. Prevent Loss of Life. The TugCam is a rapidly deployable wireless CCTV camera platform that enables any typical camera with industry standard connectors (RCA or BNC) to be remotely and wirelessly accessible on a ruggedize platform. 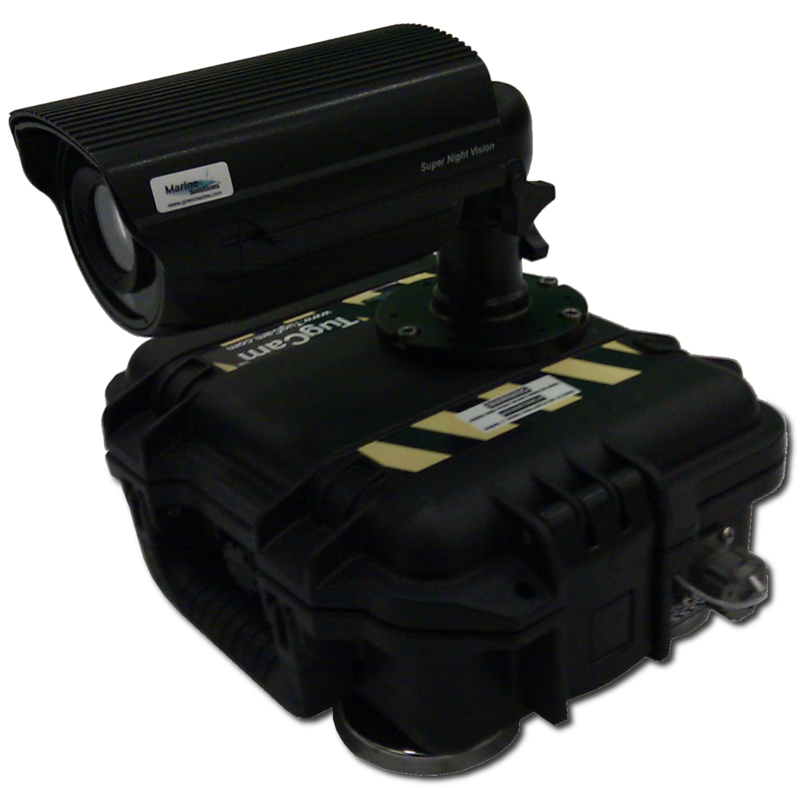 The TugCam is versatile enough that any non-wireless CCTV cameras can be mounted on the unit: night vision, infrared or black/white/color cameras. The TugCam comes equipped with a built-in lithium battery with operating times of 2 to 24+ hours depending upon the battery options, number of cameras and transmitters. The unit comes equipped with one to three wireless transmitters that can reach anywhere from 500ft to 3000 feet. Longer range transmitters of up to 10+ miles are also available. A wide variety of cameras from Netarus can be connected and configured on the platform. The USCG requires all vessels to maintain a proper lookout at all times. The TugCam from Netarus is designed to supplement or be a secondary source for the “eyes and ears” of the lookout via audio and video transmitted wirelessly by the TugCam back to the wheel house. When do I need a Look-out? According to Rule 5, all vessels are responsible for maintaining a proper look-out at all times – this includes one-man crews, unmanned crafts, and recreational boats. The term look-out implies watching and listening so that he/she is aware of what is happening around the vessel. The emphasis is on performing the action, not on the person. Still, in all but the smallest vessels, the lookout is expected to be an individual who is not the helmsman and is usually located in the forward part of the boat, away from the distractions and noises of the bridge. While no specific location on a vessel is prescribed for the lookout, good navigation requires placement at the point best suited for the purpose of hearing and observing the approach of objects likely to be brought into collision with the vessel. The size of the vessel and crew effect this answer, however, the emphasis in every legal decision points to the need for a proper, attentive look-out. While the use of radar to evaluate the situation is implied in the requirement to use all available means, that is still understood to be secondary to maintaining a look-out by sight and hearing. Reference: NavRules Frequently Asked Questions; http://www.navcen.uscg.gov/?pageName=navRulesFAQ#0.3_12. The TugCam is secured to the vessel by heavy-duty magnets on the unit. These magnets allow the TugCam to be quickly and easily moved from one location to another on the vessel. Weighing approximately 27lbs (12kg) with the battery, the TugCam’s magnets require approximately 400lbs of torque to be removed once put in its location. Various mounting options are also available to be customized to meet nearly any situation. The TugCam is designed to handle the day-to-day abuse in the harshest marine environments. 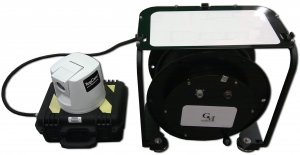 Equipped with marine-grade power switch, battery condition gauge and power plug, the TugCam is a rapidly deployable self-contained remote power and wireless video transmission platform. The unique design makes the TugCam portable to be relocated to other sections of the vessel by use of the two attached handles or optional carrying strap. Does the TugCam Float? Netarus prides itself in producing high quality products. Every TugCam has an optional rugged Pelican™ carrying case specially designed to transport the unit and cameras. As a part of every quality assurance test, every TugCam is tested for being completely sealed prior to shipping. Netarus adds these additional steps to ensure that each unit will be fully operational even in the wettest of environments. In addition, each unit can float in the event that it is accidentally dropped and/or knocked overboard (with no battery installed). The TugCam from Netarus is a collision avoidance platform to provide another point-of-view that is critical in the navigation process. 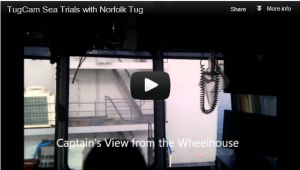 From the comfort of the wheel house, any pilot or captain can safely monitor situations with their own eyes. The TugCam will improve the safety of the crew and its cargo by placing the captains eyes and ears in the deadzone. With the versatility to locate a camera anywhere, the TugCam is the ideal solution for improving the safety record of every marine vessel. Rugged 2.4Ghz wireless 8-channel CCTV camera distribution platform with marine-grade RCA interfaces. Magnetic base and handles for easily mounting and relocating. Power switch and battery indicator. Self-contained rechargeable battery with marine grade charger. Support for one or more rugged waterproof marine-grade cameras. Indoor receiver to connect in the wheel house with RCA interface. Buoyant design in the event of accidental submersion in water. Compatible with many Netarus supplied cameras. 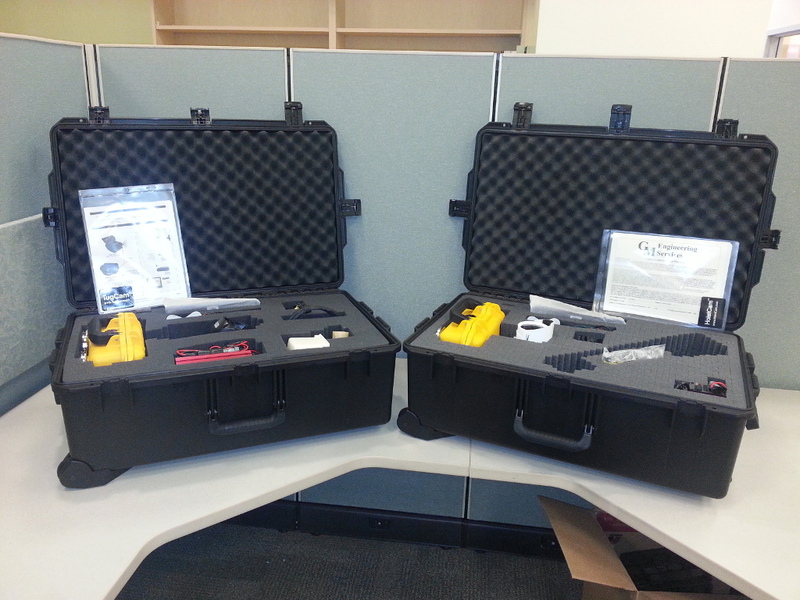 Rugged Carrying Case – Store and transport the TugCam in a rugged carrying case. Outdoor Receiver – Every TugCam comes with an indoor receiver to be easily mounted next to a monitor or DVR (digital video recorder). Upgrade to outdoor model for improved distance and LOS (Line Of Site). Multiple Cameras – Support for two or three waterproof cameras with additional indoor transmitters and receivers. Pan-Tilt-Zoom (PTZ) Cameras – Control the zoom and direction of the camera wirelessly from inside the wheelhouse. Microphone – transmit audio back to the wheel house for improved situational awareness. Extra Battery – Quickly swap out batteries. Rapidly Deployable Video Surveillance (RDVS) platform with portable display and integrated DVR. Blackberry, Android and Apple (iPad and iPhone) interfaces for tablets and smartphones. Additional Mounting Options – Alternative mounting options other than magnetic base are also available. Please contact us for more information. 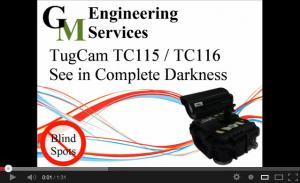 * – Reference the warranty included with each TugCam for full limitations and details. Title 46: Shipping; CHAPTER I: COAST GUARD, DEPARTMENT OF HOMELAND SECURITY; SUBCHAPTER B: MERCHANT MARINE OFFICERS AND SEAMEN; PART 15: MANNING REQUIREMENTS; Subpart G: Computations; 15.850 – Lookouts. The requirements for the maintenance of a proper lookout are specified in Rule 5 of the International Regulations for Preventing Collisions at Sea, 1972 (33 U.S.C. 1602(c)), and Rule 5 of the Inland Navigational Rules Act of 1980 (33 U.S.C. 2005). Lookout is a function to be performed by a member of a navigational watch. 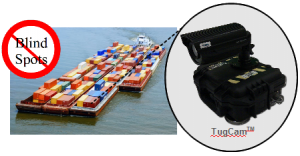 The TugCam is a remote wireless camera platform that enables towboats, tugboats, tankers and large vessel operators to deploy a camera anywhere at anytime without leaving the comfort of the wheel house. The TugCam gives every maritime captain or pilot the vision to see from nearly any point of view on and off the vessel. Netarus provides a full-line of rugged and customizable cameras, displays, DVR (digital video recorders) and complete situational awareness platforms for the maritime industry. For more information, pricing and availability on the TugCam, please contact us at +1 (757) 819-4600. TugCam™ is a trademark of Netarus, LLC. All rights reserved.